Exclusive Thailand & Vietnam Golf Tour + Saigon 3 night extension. Arrive at Bangkok International Airport and meet Golfasian guide for private transfer to the AVANI Pattaya Resort & Spa. Welcome dinner hosted by Gary Allomes. After breakfast, transfer to the Old Course, Siam Country Club for a round of golf at this prestigious and famous golf club. Siam Country Club is the home of the LPGA in Thailand. This private and exclusive golf club has hosted many national and international golf events, including 4 Thailand Opens. Your first round of golf at the Old Course will be one to remember. A non-golfing day, allowing guests to enjoy the wonderful facilities of the resort, including the magnificent AVANI Spa. Other options are to explore the city of Pattaya or include a popular tourist attraction such as an island cruise or elephant ride and jungle tour. Optional golf available on request at Siam Country Club Waterside Course. More great golf at Siam Country Club After breakfast take a short transfer to the other famous Siam Country Club course, the Plantation! The Plantation course was built at the same time during the renovation of the Old Course and opened in April 2008. The Plantation is a 27-hole golf course and has a clear distinction from the Old Course. The routing sits high on rolling hills of the natural terrain meandering mountain and natural creeks with a panoramic view of Pattaya. The host of the 2015 Thailand Open, the Plantation is a memorable golfing experience. Time to say goodbye to Pattaya … Danang here we come! After breakfast, check out of the hotel and transfer to Bangkok International Airport for the 1 ½ hour flight to Danang, Vietnam. Transfer to your luxurious 5-star hotel, the Hotel Royal Hoi An to rest before a special and authentic evening meal in historic Hoi An. After breakfast, take a short drive to the Montgomerie Links, Vietnam for a round at this famous golf club. Eight-time European Order of Merit winner and 2010 Ryder Cup-winning captain, Colin Montgomerie, designed the beautifully presented links-style course. It was the first – and remains the best – of the new courses to be created in the Central Coast area. The 2012 Forbes Travel Guide rated Montgomerie Links as one of Asia’s ten most elite courses, and it recently won a prestigious Asia Pacific Golf Award. Take a break from golf today, and explore the city of Danang and Hoi An. Previously occupied by both the French and the Americans, Danang marks the halfway point between the capital in the north, Hanoi, and Ho Chi Minh City in the south. Tour the UNESCO World Heritage Site, the Old Town and local markets. Apart from some shopping highlights and historical sights, the main attraction for tourists is its excellent golf courses, and famous beaches, My Khe Beach and Lang Co Beach. Another option is to travel the 1 ½ hour drive to the historical town of Hue. This deeply evocative capital of the Nguyen emperors still resonates with the glories of imperial Vietnam, even though many of its finest buildings were destroyed during the American War. Hue owes its charm partly to its location on the Perfume River – picturesque on a clear day, atmospheric even in less flattering weather. Today the city blends new and old as sleek modern hotels tower over crumbling century-old Citadel walls. Optional golf available on request at Ba Na Hills Golf Club. 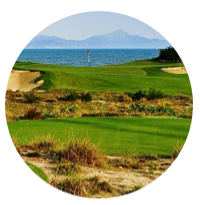 Save the best golf for last … BRG Danang Golf Resort! After breakfast, a 15-minute drive will have you at the gates of the BRG Danang Golf Resort. The Dunes course is built amid 150 hectares of landscape similar to what the world’s first golf courses were carved from. Its chief feature is a 7,160-yard, 18-hole, links-style layout that was designed in the true spirit of the game by Australian golf legend and former world # 1, Greg Norman. The Dunes offers breathtaking views of the Marble Mountains, East Sea and Cham Islands and is a great golfing challenge! Time to say goodbye to Danang, Vietnam The last day of this tour, and following a leisurely breakfast, checkout and transfer to Danang International Airport for flights back to Australia, or travel to Ho Chi Min City for a tour extension for a couple of days soaking up the culture and atmosphere of this bustling and seemingly chaotic city, the largest in Vietnam. Siam Country Club Pattaya Old Course is the first privately owned golf club in Thailand, founded by the late Dr. Thaworn Phornprapha, originally designed by I. Izumi. The golf course opened in 1971, and had hosted the Thailand Open 4 times together with many Asian golf tournaments, and most recently after the renovation in 2007, becomes home of the LPGA in Thailand. Lee Schmidt of Schmidt & Curley Design Inc. took on the redesign of the Old Course but kept the original routing of Izumi and many of the old characters. Bunkers are added for a modern aesthetic look, feel and landscape. 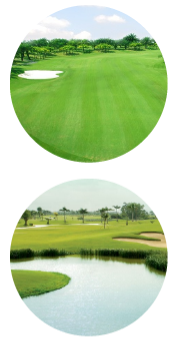 Seashore Paspalum is chosen for fairway grass and Novotek for greens. Despite a new look, the Old Course remains a classic traditional parkland course, with many fond memories of the past. Classic, beauty, and challenge are what the Old Course is known for today in Thailand. Shortly after the Old Course was opened in March 2007, it hosted a world-class tournament, Honda LPGA Thailand 2007 in October. In February 2009, the tournament moved to Siam Country Club Pattaya Plantation. Since 2010, the Old Course has become home of the LPGA tournaments in February. Events such as the LPGA are testimony to the quality of the golf course, clubhouse, and services. The Plantation Course was simultaneously built at the same time during the renovation of Siam Country Club Old Course, and opened in April 2008. Designed by Lee Schmidt of Schmidt & Curley, the Plantation is a 27-hole golf course and meant to have a clear distinction from the Old Course. Fairways, bunkers and greens are uniquely different from any other golf courses in Thailand. The routing sits high on rolling hills of the natural terrain meandering mountains and natural creeks with a panoramic view of Pattaya. Strong wind is one of the natural character and part of the challenge but the breeze makes the hottest day more pleasurable. The “PLANTATION” name was given in the honour of the historic Sugar Cane, Tapioca, and Pineapple plantations, and each nine-hole is named accordingly. One year after the Plantation open, it hosted the Honda LPGA Thailand 2009 in February, a testimony to quality and service of the golf course. From 2009 onward, the Plantation has been awarded the “Best Maintained Golf Course in Asia Pacific.” A unique architectural “Bird Wings” clubhouse sets on top of the hills. Views of the golf course and its surround undulating terrain can be seen from almost every corner of the clubhouse. From the front balcony, view of the only “Triple Greens,” in Asia, 3 greens of 3 golf holes occupying almost 3,000 square meters is a memorable sight. Montgomerie Links is located midway between Hoi An and Danang, Vietnam’s vibrant fourth largest city. It is just 15 minutes’ drive from Danang International Airport, which is serviced by direct local and international flights. Eight-time European Order of Merit winner and 2010 Ryder Cup-winning captain, Colin Montgomerie, designed the beautifully presented linksstyle course. It was the first – and remains the best – of the new courses to be created in the Central Coast area and the accolades have already started to grow. The 2012 Forbes Travel PO BOX 335 Mount Hawthorn WA 6915 P +61 (8) 9313 8646 E info@internationalgolfspecialists.com.au www.internationalgolfspecialists.com.au Guide rated Montgomerie Links as one of Asia’s ten most elite courses, and it recently won a prestigious Asia Pacific Golf Award. Acclaimed by local and visiting golfers alike, it is challenging enough to test the best players, while being eminently playable and enjoyable for mid and higher handicappers. The Dunes course is situated on the fledgling central coast of Vietnam amid 150 hectares of landscape similar to what the world’s first golf courses were carved from. Its chief feature is a 7,160-yard, 18-hole, links-style layout that was designed in the true spirit of the game — blown-out bunkers, firm and fast fairways that bleed gently into wild seaside vegetation, rugged waste areas, swales and hollows — by Australian golf legend and former world No. 1 Greg Norman. It lies in close proximity to two of Vietnam’s most historic destinations — UNESCO World Heritage sites Hoi An and Hue — and offers breathtaking views of the Marble Mountains, East Sea and Cham Islands. Certainly, Mother Nature had a gigantic hand in the formation of a layout that evokes an experience often found in seaside courses in the British Isles and south-eastern Australia. But make no mistake: This is Vietnam. One look at the stunning, par-3 16th hole – back-dropped as it is by traditional, long-tail fishing boats that troll the warm waters of the East Sea – is all it takes. Relax in this tropical oasis in Pattaya. Retreat to a peaceful, quiet oasis nearby all the big attractions. At AVANI, the options for fun and adventure are endless. Enjoy an exhilarating recipe of sun, sea and sand. Get active with water sports and activities on the shore. Whether you want to relax, get an adrenaline rush or make like a local, AVANI’s got you covered. Let our Thai hospitality and service take care of your every whim. AVANI Pattaya Resort & Spa has endless options for fun, romance and adventure. Explore the seaside with energy and ease. Just how you like it. Combining the delicacy of Japanese touch and the luxury of Indochina architecture, Hotel Royal Hoi An is the first and only MGallery property in Hoi An, as well as a proud member of the elite collection in Vietnam. Standing majestically alongside the tranquil and beautiful Thu Bon River, Hotel Royal Hoi An dazzles the eyes with elegant decorations and intuitive design. Inspired by the rich heritage of Hoi An town and the love story between Sotaro and Wakaku, our designers brought together an iconic 5-star hotel in the heart of Hoi An. With 120 luxurious room, an Art-Nouveau outdoor pool, the first ever high-end Japanese restaurant in town, an exclusive spa from the best staff you can find, Hotel Royal Hoi An is the ultimate destination for a remarkable journey in the remarkable Hoi An. Centrally located on the beach and just steps away from a range of attractions, discover a luxury hotel that will exceed your every expectation. Following the end of the THVN14 golf tour, transfer to Danang International Airport for the 50-minute flight to Ho Chi Min City (Saigon) international airport. Private transfer to your hotel for check-in and leisurely stroll around District 1. Own arrangements for dinner. 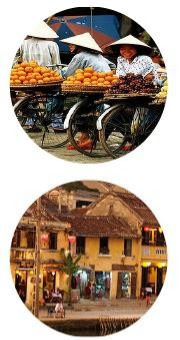 After breakfast, take a ½ Day “Best of Saigon” City tour and explore the many delights and highlights of this amazing and bustling city, the largest in Vietnam. Optional round of golf at the top golf course in Saigon, Tan Son Nhat Golf Club. Own arrangements for dinner. This day is for decisions about your excursion options. After breakfast, travel by fast luxury speedboat to the famous Cu Chi Tunnels or to the Mekong Delta via the Saigon River. Select an early or late morning departure and enjoy a peek at traditional life along the riverbanks on this half or full day tour. Numbers are limited to 14 to ensure a personalised experience on this small-group tour. Farewell dinner at an authentic local restaurant. Time to say farewell to Saigon and your touring friends. After breakfast, transfer to Saigon International Airport for return flights to Australia. End of Saigon tour extension. One Of The oldest Hotels In Ho Chi Minh City since 1930 and completely restored in 1997, nestled in Saigon's scenic riverside area and within walking distance to major commercial and entertainment addresses, the Grand Hotel Saigon still retains its French colonial style, and provides a perfect base for conducting business or for having a completely relaxed holiday. PO BOX 335 Mount Hawthorn WA 6915 P +61 (8) 9313 8646 E info@internationalgolfspecialists.com.au www.internationalgolfspecialists.com.au Our philosophy is to satisfy our guest in every possible way. Therefore, we've tried to create a place you're yearning to be. A place that is beautiful and comforting, where you can work and take proper leisure, where the quality of services make your life truly worthwhile...that's exactly the kind of life, we try to evoke through our services at Grand Hotel Saigon. Inside this French colonial style hotel, you will find 226 luxurious guestrooms and suites with panoramic views of Saigon River and the city; VIP Lounge, Western & Asian Restaurants, Rooftop Grand Cafe, Bars & Spa, as well as friendly and professional staff. Our proud tradition of hospitality is evident in every detail, making your stay an engaging and memorable experience. Stay once and you will come again! In the case where golfing in Asia is your main holiday objective, you most likely would have booked your golf holiday through a specialised golf tour operator such as Golfasian who is well equipped to properly handle and secure golf equipment and has already factored in baggage transfers into your package. Citizens of ASEAN, European, Australian, and America countries do not require a visa to enter Thailand on golf tourism up to 30 days duration. Australian citizens require a visa to travel to Vietnam. You must either arrange a visa prior to departure or obtain an official approval letter to get a visa on arrival. We recommend the first option. You can apply for a visa any time from six months before you travel.